Staircase to first floor with cupboard beneath, laminate flooring, radiator. Front aspect triple-glazed window. Wall mounted wash hand basin, low level w.c., fully times walls, laminate flooring, radiator. 15' into bay x 11' 8" (4.57m x 3.56m) Front aspect triple-glazed walk-in bay window. Laminate flooring, radiator. 15' 6" x 11' 8" (4.72m x 3.56m) Rear aspect triple-glazed bi-fold doors into Conservatory, feature fireplace, radiator. 13' 9" x 8' 7" (4.19m x 2.62m) Rear aspect triple-glazed French doors to rear garden. 12' 9" x 9' 2" (3.89m x 2.79m) Rear aspect sliding triple-glazed window, laminate flooring, radiator. 12' 5" x 11' 11" (3.78m x 3.63m) Rear aspect triple-glazed window and side aspect triple-glazed door to outside. Comprises of a range of eye and base level units with roll edge work surfacing, inset one and a half bowl sink and drainer with mixer tap, space for range cooker with extractor over, breakfast bar, space for fridge freezer, space and plumbing for washing machine and dishwasher, tiled flooring, radiator. Front aspect window, airing cupboard, Access to fully boarded loft with pull down ladder, pine boarded ceilings and Velux window. 16' 8"max x 14' 2"max (5.08m x 4.32m) Front aspect triple-glazed window. Radiator. Door to. Side aspect triple-glazed window. 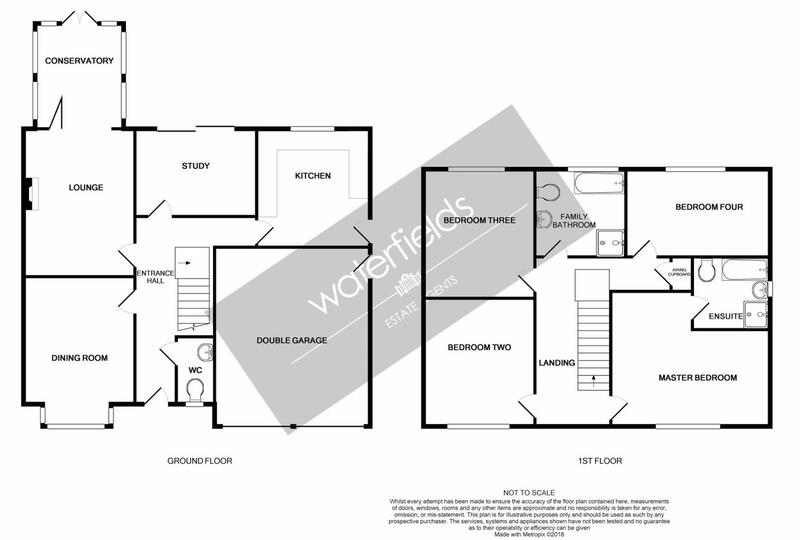 A four piece suite comprising of a panel enclosed bath with mixer tap, separate shower cubicle, vanity unit with inset wash basin and mixer tap and storage beneath, low level w.c., heated towel rail, fully tiled walls. 13' 5" x 11' 9" (4.09m x 3.58m) Front aspect triple-glazed window. Radiator. 13' 6" x 11' 9" (4.11m x 3.58m) Rear aspect triple-glazed window. Radiator. 15' 1" x 9' 2" (4.60m x 2.79m) Rear aspect triple-glazed window. Radiator. 9' 8" x 9' 2" (2.95m x 2.79m) Rear aspect triple-glazed window. A four piece suite comprising of a panel enclosed bath with mixer tap, separate shower cubicle, pedestal wash basin with mixer tap, low level w.c., fully tiled walls, radiator. This area is to the side of the property and is accessed via double wooden gates and has light and power. Integral double-garage with two separate up-and-over doors, light and power, courtesy door to side of property. To the front there is block paving leading up to the Double Garage with further gravelled area, herbaceous beds and borders, double door access into Workshop/Dry Storage, gated side access to the rear. To the rear there is a paved patio with the remainder mainly laid to lawn with steps down to a further sunken patio with various herbaceous beds and borders, timber shed, outside tap and lighting, raised ornamental fish pond, enclosed by wood panel fending, gated side access to the front.